Recently I assembled a classic Italian meal that included a very old, uncomplicated dish that dates back 800 years. I’m talking about Cotoletta di vitello nello stile di Milano, aka Veal alla Milanese. Milan is 200 miles from Vienna, Austria, and both regions have a similar veal dish. During the middle- ages in northern Italy and Vienna, veal was the customarily consumed meat; baby beef that had been fed only mothers milk and whose flesh was white. Rather than grazing and feeding the animal, they used it as soon as it was weaned. Properly cooked veal has a magnificent delicate taste impossible to duplicate with any other meat. The Austrian counterpart to Cotoletta Milanese is the far better known Wiener Schnitzel. Wiener means Vienna and Schnitzel is derived from an old German word meaning “to slice”, so basically it refers to sliced veal Vienna Style. Tenderizing tough meat was an old technique from the dawn of history and pounding the veal also makes it look more attractive. 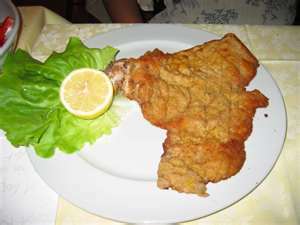 Veal alla Milanese was first prepared back in the 12th century and Wiener Schnitzel centuries later. Dredging the meat in flour and spices dates back to medieval times. In the 19th century, Milan was part of the Austro-Hungarian Empire. A Milanese cook went from Milan to Vienna to work at the court of the Emperor. While in Vienna he introduced the breaded veal cutlet to Viennese society, who embraced it with a passion. This breaded Veal Milanese is also made in France where it is called Escalope de Veau Viennoise and served with hard-boiled eggs and anchovies. · With the flat side of a meat mallet, thin the veal by pounding it gently; pound down and out from the centre towards the edges. Careful attention is necessary at this point. You want to thin down the meat, but not crush it. You can put plastic wrap under and on top of each cutlet if you want to, or wet the mallet with cold water, which helps it slide on the veal without tearing it. The pounded slices should be ¼ inch thick, no thinner. · Put the milk in a shallow pan and turn the veal in it. · Cover the pan and chill in the refrigerator for an hour. · Remove the veal, drain it and pat it dry. · Dip each slice into the flour, shaking off excess. · Add the teaspoon of oil, a dash of salt and pepper and the water to the beaten egg. Dip both sides of the meat into this mixture. Squeeze out the excess. · Spread out the breadcrumbs; dip in both sides of the veal, being careful to coat each evenly. Shake off excess. · Pat the breaded veal with the flat side of a large knife or a metal spatula. · I prefer to lightly cut a crisscross lattice pattern on top of each cutlet, not deeply. · Refrigerate the cutlets until ready to cook. · Heat the oil in a big skillet. Add the butter. Heat should be medium. · Add the veal, starting with the marked side down; don’t let them touch each other, cook for 4 minutes without moving them so they crust up handsomely. · After 4 minutes, lift the edge and see if it looks like a nice golden crust has formed. If so, turn and cook the other side. Plate the cutlets, sprinkle with parsley and garnish with lemon wedges. This goes very well with Risotto Milanesa a creamy rice preparation containing saffron. The Veal alla Milanese technique is easy to learn, and makes a wonderful meal. I hope you will try it, but I warn you, Veal loin chops are a premium priced item. You can however use this technique on chicken, pork and many other types of meat. Be sure to stop in at http://educationtipster.blogspot.com for the schedule of my spouses Virtual Book Tour, which is happening right now. Get in on the fun, leave a comment and your name goes in the hat for a prize. This looks delicious! I love Italian food. Thanks for this little history lesson, too. That looks great ... That good! Interesting story for something that looks like a delicious dish. Yay! Cotolette! I love them drizzled with balsamic vinegar syrup and a simple lettuce/tom salad. My mother-in-law makes it all the time, but she skips the milk and flour part... maybe that's just the Sicilian way of doing it? Great story and I love Veal so this jumped out at me thanks for the recipe! LUANA: It is delicious, Thank You for visiting. LEOVI: Try it and smile plenty. MISHA: It's all true; and a wonderful dish. FA: I like that touch of balsamic syrup. Totally used to the breading procedure though. RA: Is! Thanks for visiting. PEGASUSLEGEND: Yes, this is probably right up your alley.